She sizzled onscreen with the hottest leading men in Hollywood—Gary Cooper, Cary Grant, Charles Boyer, Robert Donat, James Stewart, Ronald Colman—but Marlene Dietrich’s most memorable co-star may have been a balding, jowly, irascible middle-aged man. 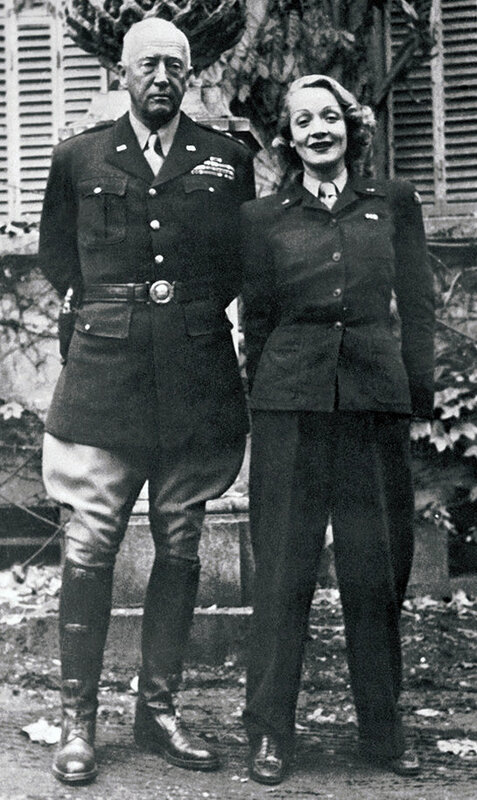 While entertaining the troops during World War II, she ventured within a mile of the German front lines on the arm of Gen. George Patton. When asked why she’d take such a huge risk—especially when the Nazi government had placed a seven-figure bounty on her head—she replied, “Aus anstand.” Out of decency. 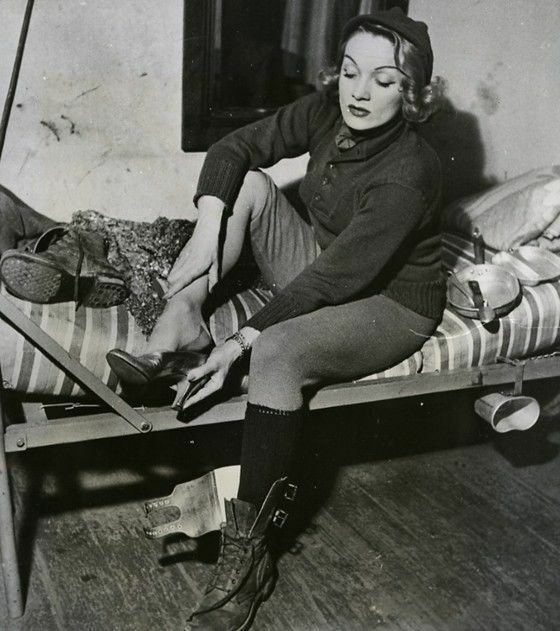 A staunch anti-Nazi, the Berlin-born actress had become a U.S. citizen in 1939, refusing a personal request from Adolf Hitler to return to Germany as the centerpiece of his propaganda campaign. 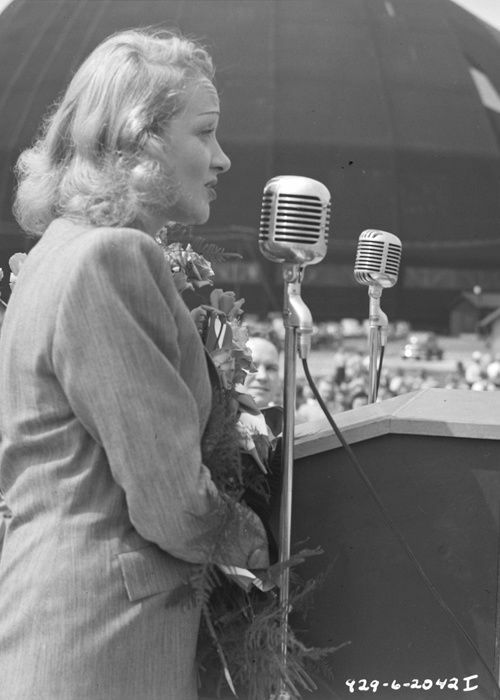 Following the attack on Pearl Harbor, she was one of the first in line to sell war bonds. 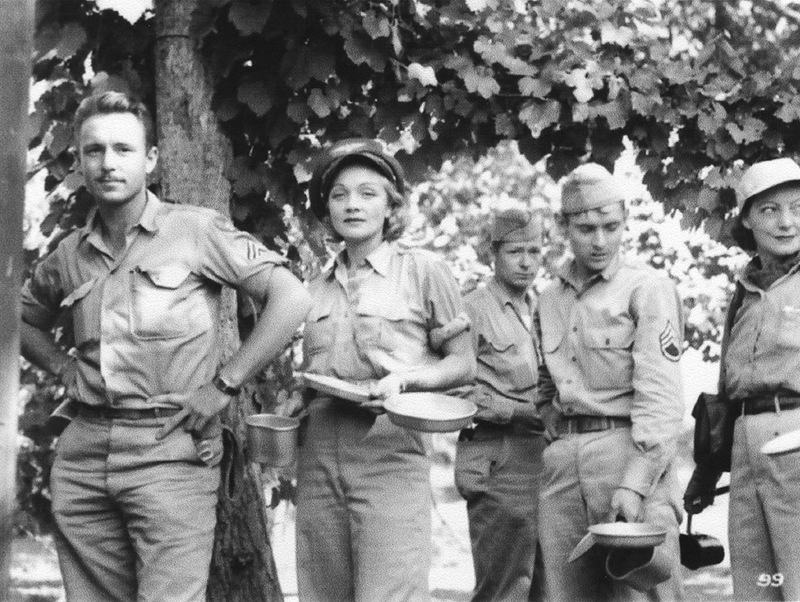 After barnstorming the country for a year and a half, selling more bonds than any other star, Dietrich headed for the front lines in 1944, spending the rest of the war performing for Allied troops in Algeria, Italy, Britain, France and Belgium. She’d roll up her sequined gown in a knapsack as a makeshift pillow, and wash her silk skivvies by sloshing them around in a helmet filled with melted snow. 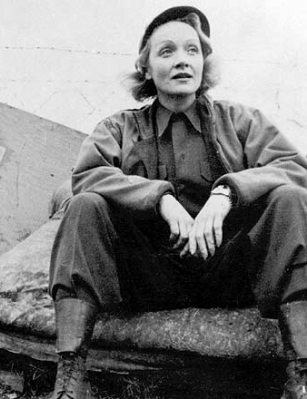 She fought off frostbite, influenza and near-pneumonia, and scoffed at the more immediate threats on her life that arrived by way of bombs, grenades and rifle fire. She arrived in a rush, she returned daily for an entire week, she remained and left in a rush. It was her style. First order of business was a show, presented to the patients who were able to gather in the huge cafeteria/dining hall. Marlene sang, did magic tricks and told raunchy jokes. She was clad in a translucent, shimmering blue gown, slit to reveal those million dollar legs… Before she turned the show over to her supporting musicians and entertainers, she hiked up her dress and paraded across the stage. Then she started tossing autographed blue garters to the audience. There was pandemonium, bedlam. Wheel chairs collided; crutches and canes became weapons as the men fought to capture a prize. The authorities had to stop the show to keep from adding to the casualty list. Marlene then began a relentless, seven-day, dawn-to-dusk tour of the entire hospital. She visited every room except the quarantine ward. She sang, she joked, she gave autographs, she flirted; she ran from bed to bed and room to room. I struggled to keep up with her. She never stopped. She lived on cigarettes, coffee and martinis, worked 16-hour days every day, and was a hell of a trouper. At one time she met up with Rita Hayworth’s kid brother. He was wounded and distraught because he couldn’t get a message home to tell his family that he was recovering. 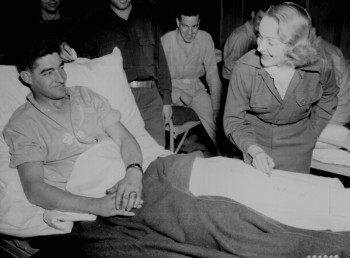 La Dietrich marched into the hospital commander’s office, commandeered a phone and put through a call from Naples to Hollywood. She was able to link mother and son, transoceanic. She was middle-aged, she was a mother, in fact she was a grandmother, but unlike any grandmother that I had ever met. She was kind, caring and fun to be with. She autographed a picture for me and even signed a cartoon-like drawing that my girlfriend then, later my wife of many years, had sent me. Unfortunately the cartoon disappeared from the letter I sent to Jane. I always suspected some dishonest censor. I even tried to trace it but to no avail. Finally the week was up and Marlene and company moved on. It was a tearful goodbye. 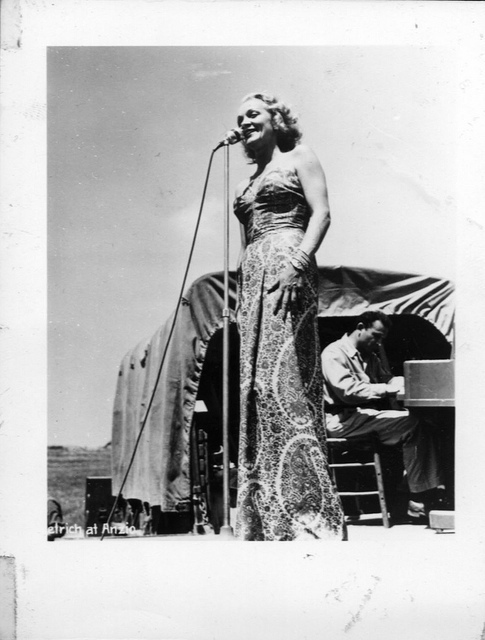 Few entertainers matched the Blue Angel with her husky voice, her glamour, and her genuine dedication to the troops. When she finally left I had to go back to bed for two days to recover from the pace of trying to keep up with her. 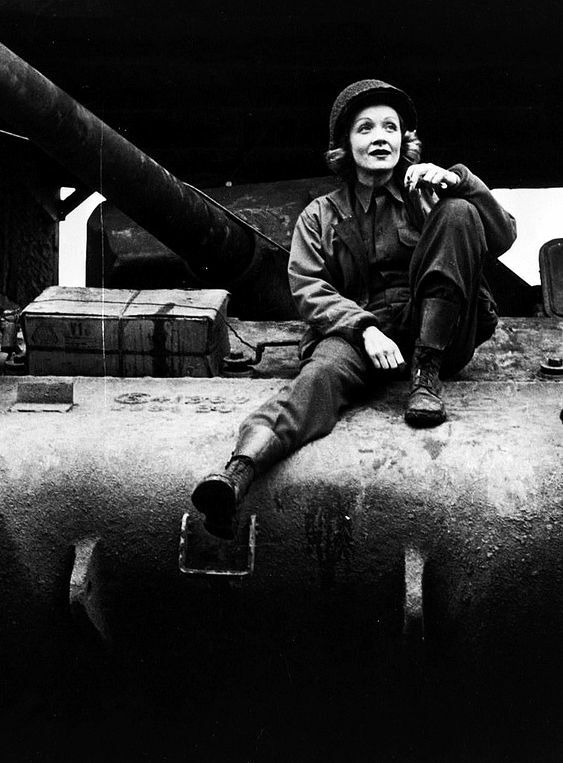 You can be certain that I became and remain an avid fan, loyal to the memory of Marlene Dietrich—the lady who laughed at Hitler, refused his command appearance order and poured body and soul into the WWII effort. 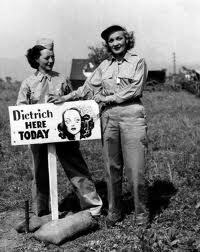 ← Buy Your Christmas War Bonds from Bette Davis! 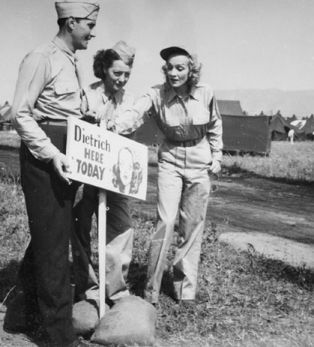 Love this post, such a personal insight into Dietrich beyond the ‘stage managed’ photo ops beloved by Hollywood. Wow! I knew she did a lot during the war but her efforts belong the “above and beyond the call of duty” category. Thanks for such an interesting post.